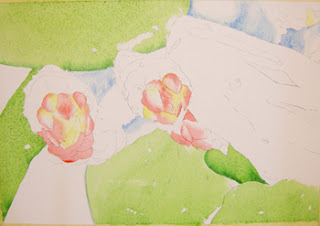 I want to get some more of the flower heads established in this piece, since the flowers are my focal point. I have used Winsor Red and Quinicridone Magenta to develop some of these areas. Just as I described yesterday, vary your edges from crisp to soft. Soft transitions are made with water pushed into the stroke before it dries. Crisp edges are made by directly applying pigment to the dry paper and leaving it alone. Let your photo reference be your guide. Look for crisp edges that can be painted directly, and then look for areas which would be appropriate for that Softened Edge Stroke (see previous post). I have also added some more Permanent Sap Green and Hookers Green to areas of the plant that have not yet been developed. In the area on the right of my image I used a little wet-in-wet technique by laying in a wet wash of Sap Green, then dropping in Hookers Green where I wanted to add soft shadows.